The subject of hypnosis has not lost any of its ability to fascinate and intrigue – and this holds equally true for both the layperson and the student of hypnotic behavior. Phenomena of hypnosis range from simple tasks involving ideomotor response to more complex tasks involving substantial distortions of perceived reality such as age regression, hallucination, and amnesia. Obviously, with a topic so diverse and so interesting, there are plenty of books around. 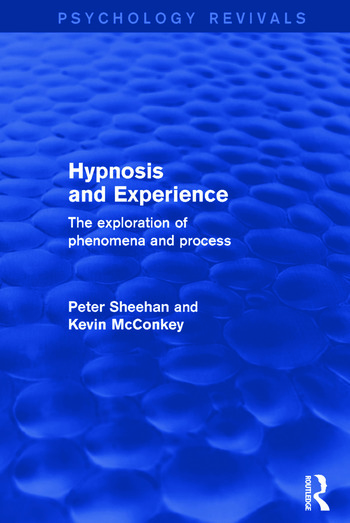 Originally published in 1982, what makes this title stand out is the authors’ focus: instead of trying to survey the whole field and evaluate the full spectrum of theories about hypnosis, they hone in on specific points of view with the aim of illustrating the nature of hypnotic phenomena. Preface 1. Consciousness and Altered Awareness 2. The Assessment of Hypnosis: A Survey of Measuring Instruments 3. The Experiential Analysis Technique 4. Ideomotor Response in Hypnosis 5. Age Regression and Tolerance of Incongruity in Hypnosis 6. Hypnotic Dreams and Hallucinations 7. Posthypnotic Amnesia 8. Cognitive Persistence: A Case Analysis 9. Modified Applications of the EAT 10. Overview and Conclusions: Toward the Understanding of Phenomena and Process. References. Author Index. Subject Index.